Villanova coach Jay Wright says his 13th ranked Wildcats are ready for the challenge of playing three consecutive Big East Conference road games. To prove its coach right, Villanova will have to do something Sunday in Madison Square Garden that it hasn't done - keep St. John's star guard Shamorie Ponds under wraps. The 6-1 Ponds is pouring in 28.7 points per game when facing the Wildcats the last two years, including 23 on Jan. 8 when Villanova rallied for a 76-71 win at home in Finneran Pavilion. What's more, Ponds had a stretch of nine consecutive games of at least 20 points against Big East foes stopped in a 77-73 overtime win Tuesday night against Butler, ending up with just 14 on 4 of 12 shooting. Ponds has been known for his big play in big games - just ask Duke last February, and Marquette on New Year's night this year - and the Red Storm (18-7, 6-6) need the big-game version of him to show up as they chase their first NCAA Tournament berth under coach Chris Mullin. "I know for sure they're resilient," Mullin said after the victory over Butler, according to the the New York Post. "They care about winning. The mindset is there, it's about doing it on game day. Every game in this league is a few plays from turning out the other way." St. John's first meeting with the Wildcats was a classic example. The Red Storm owned a 13-point first half lead, and an 11-point second half advantage, before Villanova changed the game. Phil Booth scored 10 of his 23 points in the last seven minutes and Eric Paschall tallied 25 points. Following that game, Mullin wasn't terribly distraught about the outcome. "We play them again," he said. "They come to New York. It's all good." It's been all good for the Wildcats (20-5, 11-1) in the Big East, save for a one-point loss Feb. 9 at Marquette. They predictably bounced back on Wednesday night, spanking Providence 85-67 with big games from their seniors. 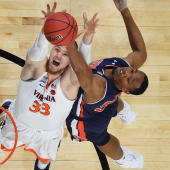 Paschall scored 25 and Booth added 22 as Villanova converted 51.9 percent from the field and canned 10 of 23 3-pointers. One concern for Wright is rebounding. The Friars earned a 36-29 advantage on the boards, collecting 16 offensive rebounds off 35 missed shots. "We've got to be tough on the boards," Wright said. "When Providence played St. John's, it was so physical the refs couldn't call everything. We've got to be ready for that going into their place." From New York, the Wildcats' road show will head to Georgetown on Wednesday night and then to Xavier on Feb. 24. Villanova will be favored in every game of the trip but faces challenges every stop of the way. Georgetown's young cast is desperate for a signature win, and Xavier is hunting an upset that would provide it with a highlight during a rare down season. "We don't care where we play," Wright said. "We talk about 94-by-50 feet, the basketball court. We enjoy being on the road or at home."